Monika Taboada had her tire punctured by a caltrop on Monday, Dec. 5, in the upper parking lot of South Tahoe High School. SOUTH LAKE TAHOE, Calif. — As more incident reports flow in, it seems that the number of tires pierced by ‘ninja caltrops’ in South Lake Tahoe is much larger than previously thought — and there doesn’t appear to be an end in sight. Les Schwab Tire Center in South Lake Tahoe says they have seen an average of two to three tires a day pierced by these objects over the last four weeks. The Tahoe Daily Tribune originally broke the story with two confirmed cases of punctured tires, and several more anecdotal accounts through Facebook, but since the Dec. 2 article, it has become apparent that the number of pierced tires totals close to 100 over the last month or so. 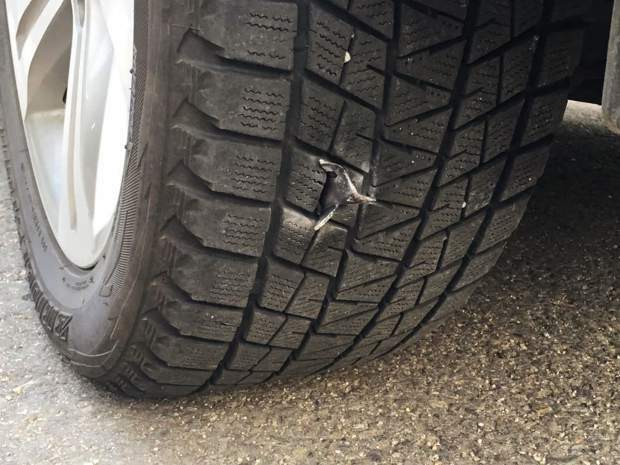 As previously reported, the metals spikes piercing tires are called “caltrops,” a four-pointed stainless steel weapon that is designed to sit with one sharp edge always pointed up. “When it first happened, it was more than two to three tires a day,” said Jesse Starkey, assistant manager at Les Schwab Tire Center, which handles tire patch ups for free. At Lilly’s Tire Services, also in South Lake Tahoe, they have seen tires punctured by these intentionally-placed metal objects for a month and a half. 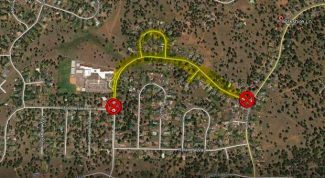 Sierra House Elementary School is located off of Pioneer Trail — one of the roads where Velazquez is consistently hearing from customers that they ran over the caltrops. “People are saying the casino area and Pioneer Trail. Those are the concentrated areas,” noted Velazquez. Although there is some overlap in areas where drivers are encountering these caltrops, there are also incidents occurring in roads and parking lots outside of those areas. Monika Taboada, for instance, recently had her tire punctured by a caltrop on Monday, Dec. 5, in the parking lot of South Tahoe High School. “I went to pick up my daughter from the high school at the upper parking lot. I pulled up and stopped, and as soon as I rolled down the window to signal my daughter, I heard this hissing sound,” said Taboada. Taboada took pictures, changed the tire, then went down to the police station to report the incident. “I’m worried it’s going to happen and someone is going to get hurt,” she added. Another South Lake Tahoe resident Kimmi Phelps’ had her tire punctured by a caltrop while pulling out of the Crescent V Shopping Center on Wednesday, Nov. 23. 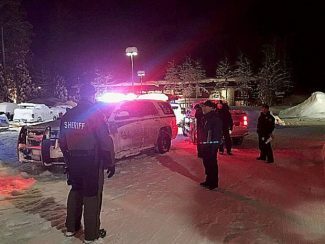 According to South Lake Tahoe Police Department spokesman Lt. Brian Williams, there are no investigative leads or witnesses in the case. The department continues to take down reports of incidents. “There is no real way to find out where the person or persons is purchasing these items. They are readily available online,” said Williams. The caltrops have been discovered all over town, which is another reason the case is proving difficult to solve. “They’ve been reported on all sides of town. In the city, in the county,” added Williams. 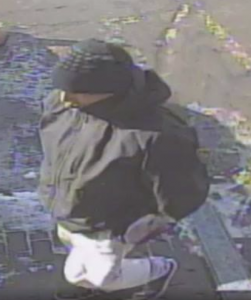 The police are not willing to speculated on the age or type of person that is committing the crime. “Speculating is dangerous. Most people would think it might be equivalent to a juvenile, but that’s not necessarily the case at all,” noted Williams. All incidents of punctured tires by caltrops should be reported to the police immediately.